I am a grandma and a great grandma many times over. I’ve received so many gifts from dozens of family members and friends that my house and basement are so crowded with heart-felt gifts for a long time now, that I don’t know what to do with it all. POSTAGE STAMPS GIFTS are practical and very special at the same time. Use Christmas stamps. Scroll Down to See Lots of Great Gift Ideas for Grandmothers who have Everything and Grandfathers too. 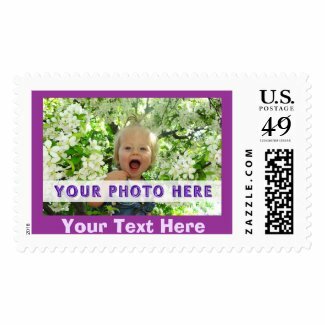 CLICK HERE to View the Personalized Stamp with YOUR PHOTO and TEXT Above. My two favorite best gifts for Grammas and Grampas are Personalized, Official USPS Postage Stamps, and a Personalized Serving Tray, which I hang on my kitchen wall, (in an attractive place) when I’m, when it’s not in use. I LOVE BOTH. Personalized Stamps are wonderful Gifts. They are a pleasure and convenience. It’s something everyone uses all of their lives, even if they have everything else. It doesn’t take up much space as some gifts can. The difference with these Postage Stamps and ordinary ones, is that they are personalized with the Photos, Text, or Designs that would bring happiness to both the giver and receivers. Really Great Gift Idea for New Grandmothers and New Grandfathers too. They will love to see their Christmas stamps photo’s of their grandchildren. I can design your personalized stamps, note cards and photo post cards or thousands of other personalizable gifts for grandmothers, new parents, baby announcement cards and more. These might be the very Best Christmas Gifts for Grandparents Who Have Everything. Wouldn’t it be a Good Gift for Grandma to give her Matching Personalized Postage Stamps and Cards and Postcards to use all year long. You could even add the grandchild’s NAME below each ones PHOTO. As we Grandparents or Great Grandparents get older and the number of grandchilden grow in number, we sometimes temporarily begin to forget one of their names, and our own kids “their parents” are hurt. If you have their names under their photo, you can always keep their picture with their name on it handy. I know it happens, cause it has happened to me a few times, with more than thirty grand and great grandchildren. The perfect Gifts for Grandmothers Who Have Everything. She will love showing off her new grandchild or grandchildren with these photo post cards and stamps. Wait until her friends see she actually has a matching set. So much fun to receive and give. Great Gifts for Grandmothers Who Have Everything. They would love to see their grandchildren photo on their very own Christmas stamps. Personalized gifts that are totally customizable by you, or you can CALL ME “Linda” and I will do it for you (with no extra charge). I can do some Photoshop adjustments, such as cropping to the correct size, brightening your picture or even a few more Photoshop adjustments at no extra cost to you. Grandma will love receiving Personal Postage Stamps with Matching Personalized Photo Note Cards or Custom Photo Postcards. Buy 1 or buy many. Bulk Discounts too. Actually, these are great Gift Ideas for InLaws Who Have Everything, parents and anyone who you know will love seeing their favorite picture on Photo Postage Stamps USPS are Official United States Postage. Great idea that are Practical Gifts for Grandma but also Meaningful gifts, these could be just right. These will also make great Mothers Day Gifts for Grandmothers too. Think of how proud she will be to send out her special letters with these photo postage stamps or to enjoy coffee while looking at her grandchildren. Her friends and family will love receiving them too. Any and every occasion will be the perfect occasion to give these practical, useful and fun gifts that will be sure to make a real impression and memory. Everyone will smile as they are putting these official photo postage stamps on the envelopes and the receiver of the special letter will smile too. Gifts for Grandmothers Who Have Everything, postage stamps with photo, will really Make someone’s day. Often times grandmothers are living on a fixed income and don’t have enough money to buy the little extras, such as postage stamps. They’d love to keep in touch with letters and cards to their large families and the many friends they have acquired over their lifetime. I do use a computer but many grandmas and grandpas don’t have one on which to send emails, and they don’t really want to learn how to use it. (See Lots of Gift Ideas for Grandmothers Who Have Everything BELOW). I made the templates to fit a typical 4 x 6 photo. I think the Medium and Large stamps look best with this size. Try it in each size stamp and see which personalized stamp size you like best. Remember to call me if you need HELP or would like me to upload your pictures for you. I can do some basic Photoshop adjustments so your image will look it’s best. CALL or TEXT Linda at: 239-949-9090. Click the Image of the Customizable Photo Stamps. Once you are on the Photo Postage Stamp Page, to your right, you will see the “Personalize it” area. Below “Personalize it” you can Click the tiny blue word “Change” located below the Temporary Image to Upload YOUR PHOTO and to Type in YOUR TEXT in the Text Box. See Detailed Instructions in the “Product Description” Read More area. 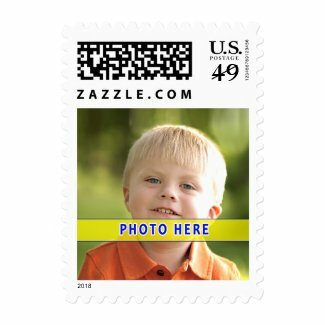 Zazzle will UPDATE Postages Value when the Post Office raises stamp prices again. This Custom Photo Postage Stamp is proportioned for a typical photo size to nicely fit your image into the easy to use template. Once you are on the product page, Click the tiny blue word “Change” underneath the “Edit this design template” area to your right. Follow the prompts to “Upload New Images” and or “Select Images to Upload” from your computer and Click “OK”. INSTRUCTIONS on How to Upload YOUR PHOTO is located within the Product Description on the Serving Tray Product Page. How much fun will it be for Gramma to see her Grandchildren. She will likely display it in her kitchen or living room for all to enjoy unless of course grandpa is serving her coffee and breakfast in bed. We just gave this Photo Serving Tray to our friends for their 50th Wedding Anniversary, because when I asked my mom for gift suggestions, this serving tray is the only suggestion she would make because she LOVES her Personalized Tray soooooooo much. It was a bit expensive for a gift from, us but we thought since it can be made just for them, it was worth it. We just gave it to them and the wife just raved about it. She immediately found a spot for it. Not only is this practical for serving her guests on the patio, it is a beautiful personalized home decor. The printing was vibrant and detailed. I love the glossing protective finish over the picture. The golden heart came out a little on the peachy side. I purposely made the heart with some peach tones and it turned out a bit more than I thought, so next time I wouldn’t add peach. Grandmas don’t know how to tell everyone that they don’t need, nor want any more stuff, thereby taking a chance of hurting someone’s feelings. I’ve talked to a few of my friends about this and they all feel the same way as I do. So, I’d like to put a little buzz in people’s ears and suggest that they buy some US Postage Stamps as Gifts for Grandmas Who Have Everything. That may sound like a ho-hum gift to you, but not to grandmas and grandpas, it doesn’t. And if you want to make it Really Special, here’s a tip that is sure to touch their hearts and put a huge smile on there faces. Buy them some Custom Picture Postage Stamps. You can have a personal photo of grandma and or grandpa, you and your whole family, your kids, a new baby, Gramma’s pet dog or cat, a photo of your new home, or anything else you think would be special to Grandparents. Can you imagine how happy she will be to again be reminded of how much you care for her, and how proud she’ll be to show off to her friends, the custom US Photo Stamps of someone she loves. Personalized Postage Stamps USPS make Great Gifts for New Grandmothers, and are fine Gift Ideas for InLaws Who Have Everything too. Custom Photo Stamps are very Practical Gifts for Grandma, as they are the one thing that she will never have too many of and they will always be appreciated and are sure to be used. Photo Serving Trays are a wonderful wall art when not in use and practical and wonderful to serve your guests coffee and dessert or serve yourself. Make the trip to the table faster and easier with these special Personalized Mother’s Day, Birthday or Christmas Gifts for grandparents, parents and other friends and family. They will love these Gifts for Grandmothers Who Have Everything. 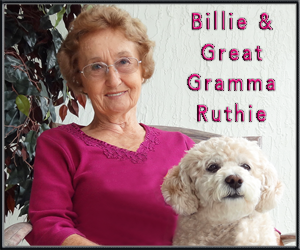 Mugs for Gramma with 2 Photos and 2 Text Boxes for YOUR TEXT. Your Grandmother will absolutely LOVE receiving this great Photo Mug with the grandchildren’s photo and the grandchildren’s NAMES. Personalized Picture Coffee Travel Mugs for ANYONE. These mugs are STAINLESS STEEL inside and outside and has a lid that turns to close. I love my mug. Quality, Outstanding Printings makes these Great Gifts for Grandmothers who have Everything. 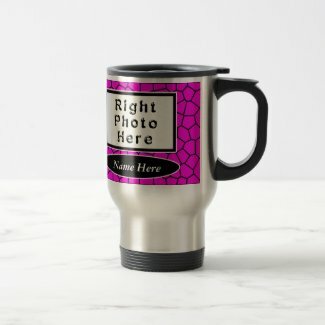 Under the “Personalize it” area to your right of the product on the product page: Use a typical sized Horizontal Picture for the Custom Stainless Steel Travel Coffee Mugs. I carefully PROPORTIONED the area for 4 x 6 images. Click the tiny blue word “Change” located underneath the Photo Here temporary image and follow the prompts to “Upload New Images”, choose your photo from your computer and click “OK”. Type in the grand kids NAMES or any short TEXT in the Two Text Boxes, also found underneath the “Personalize it” section to your right of the product on the Grandmothers Mug page. Feel Free to Call Little Linda Pinda Designs at 239-949-9090 for HELP or to Make ANY Changes to ANY of my Designs. If you see something you like and wish it were on another Zazzle Product, I can do that for you with no obligation to buy it. I will send you the link and you can purchase the Personalized Gift or Not. Remember, everything is 100% LOVE IT Guaranteed too. My mom felt comfortable enough to share with me for the past several years that she wished family members wouldn’t buy her items for around the house. She loves receiving the Personalized “Practical Gifts for Grandma” such as Personalized Photo Mugs, Personalized Aprons etc. Recently, while visiting, she STRONGLY suggested that I create Personalized Picture Postage Stamps to sell in my Zazzle shop because of the reasons she explained above. These are Great Gifts for New Grandmothers, Grandparents of older kids, Gift Ideas for InLaws Who Have Everything and Moms and Dads. Everyone will love these Personalization Gifts. Just imagine how exciting it will be for new grandmothers and new grandfathers to receive these as gifts. They will want to write more often to their loved ones showing off their new grand-baby. ALL of these great gifts can be delivered right to Grandmas Home. 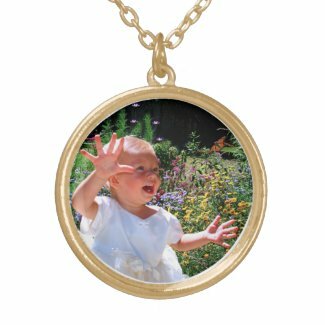 Personalized Mothers Day Gifts for Grammas that will be cherished. She will love showing her family off. How about putting a picture of her Dog. You know how to touch your grandmother’s heart. Don’t forget to write some really loving words that she will never forget. Sing Grandma a song for her Mothers Day Gift Ideas. My mom hangs her Photo Serving Tray on the Wall as beautiful artwork when she is not using it. PS: My Mom, Gramma and Great Grandmother just received her Photo Serving Tray and she said it is “BEAUTIFUL”. I designed it for her with photos of my Mom and Dad (Dad passed away), her cute little Billie, (Dog) and her Kids, Myself and my 4 Brothers. Here it is. CONTACT Linda if you would like one made just for you or your family. Twice a Day Every Day mom uses her Photo Serving Tray. She just told me yesterday again just how much she loves and uses her photo tray. My mom spoils herself a little by taking in her morning coffee and breakfast and relaxing in bed while watching the news. In the evening, she takes in her ice water, cheese snack for her and a snack for little Billie (see Billie on the tray) and unwinds in bed as she watches TV. She deserves it. My mom is such a hard working incredible mother. She said she doesn’t spill like she used to trying to carry liquids and food. I can make a similar photo tray for you. Let me know what background color your would like, if you would like any additional clip art, how many photos and other details. CALL Linda: 239-949-9090. If you would like me to design ANY Gifts for You from Zazzle, Please feel free to call me at: 239-949-9090. Calling is best because I get so many spam emails and might miss your email. If you would like to contact me via email: [email protected] or CLICK the CONTACT IMAGES and fill out email form. All these Great Gifts for Grandmothers who have EVERYTHING will absolutely delight Gramma and bring a smile to her face every time she looks at the lovingly created Personalized Gifts for Grandmothers. So when you are wondering, what are the Best Gifts for Grandmas, these Personalization Gifts are sure to be just right. I really appreciate and want to Thank you so very much for shopping at my Zazzle Store, I really appreciate it. Remember, Zazzle Guarantees everything, 100% because they are confident that you and gramma will LOVE these gifts. I love the fact that I am a designer for such a wonderful company that is world renown with such high customer service and product goals yet affordable for all budgets. Call for HELP or Special Requests. I can add your Text and Photos for You or change ANY Design. So if you are looking for really Good Grandma Gifts for her birthday or Mothers Day Gift Ideas For Grandma, consider buying these special Photo Postage Stamps USPS. What a joy it is to for a grandma to receive a gift that is definitely useful to her and that you took the time and effort to make it both pretty and personalized just for a grandma like me. Have fun creating these very special Personalized Gifts for Grandmothers, Grandfathers, Mom, Dad and someone you love. Put a bit of joy and love into someone’s day. Here is another Article with my Personalized Postage Stamps that will be good gifts for grandmothers who have everything!